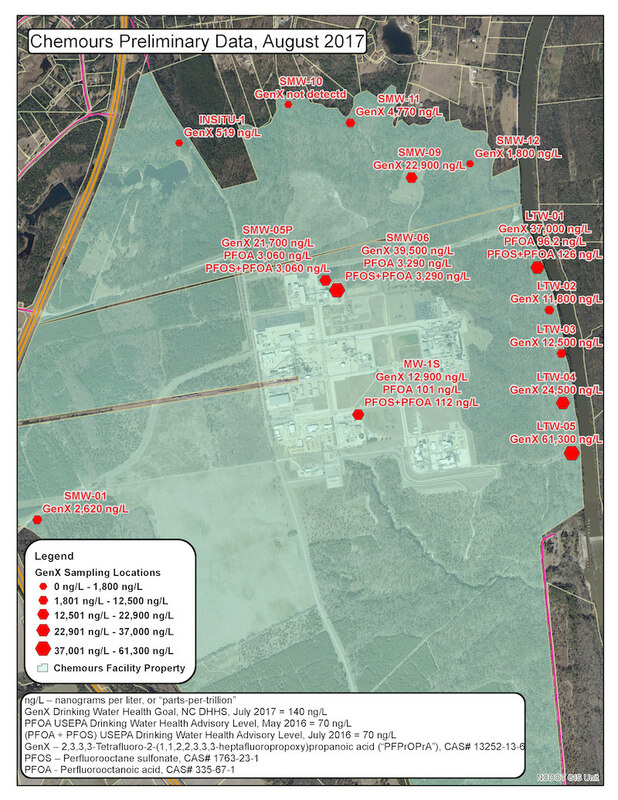 This map, provided by DEQ, shows initial sampling results for industrial monitoring wells near the Chemours plant. Although these are not used for drinking, the results prompted DEQ to begin testing residential drinking water wells within one mile of the plant. Residents who live within one and a half miles can ask the state to test their water. The testing is free. The health goal for GenX is 140 parts per trillion. The new data brings the total number of affected wells to 19, state environmental officials said. Most of the wells lie north of the plant. The results have prompted the NC Department of Environmental Quality and the Department of Health and Human Services to hold a second community information session: Thursday, Oct. 5, from 6 to 7:30 p.m., at the Gray’s Creek Elementary School gymnasium, 2964 School Road, Hope Mills. All residents who use these wells are now receiving bottled water from Chemours, the company responsible for the contamination. Testing of residential wells by Chemours and the state started soon after GenX was detected in 13 industrial, non-drinking water wells on the facility’s property. Chemours is testing residential drinking water wells near the plant for GenX; those results and the sampling protocol will be reviewed by DEQ. The state is also testing residential wells, not only for GenX but also two other fluorinated compounds, PFOA and PFOS. DEQ said it is testing for the three fluorinated compounds because they all have established health goals. GenX is the central topic on tomorrow’s agenda of the House Select Committee on River Quality. House Speaker Tim Moore appointed the committee in late August to examine water quality issues facing North Carolina’s rivers. The meeting starts at 9 a.m. in Room 643 of the Legislative Office Building. That room does have an audio stream so that people can listen online. The Senate version of the committee is scheduled to meet Tuesday, Oct. 3, at 2 p.m. in Room 1027 of the main Legislative Building. GenX was first detected in the Cape Fear River and drinking water at Wilmington’s Sweeney plant by scientists from the EPA and NC State. They reported their findings to the Cape Fear Public Utility Authority in May 2016. DEQ learned of the contamination in November 2016, but DEQ staff members and the previous leadership did not convey that information to the new DEQ leadership until June, according to internal emails.